When we think of Samburu Game Reserve, our minds tend to think of the hot and arid fringes of Kenya's vast Northern Frontier District that covers an area of 104 square kms on the northern bank of Ewaso Nyiro River. An area that is home to the Samburu tribe, pastoral relatives of the Maasai people. A landscape that is rugged and dramatic - against a backdrop of volcanic mountains, gaunt hills and withered scrub tree punctuate the sparse and dry terrain with clusters of the incredibly hardy desert rose providing the occasional flash of vivid colour. We tend to imagine ourselves on game drives or relaxing in the amazing safari lodges that are present in the Samburu. What we do not tend to think is...... A Camel Derby! 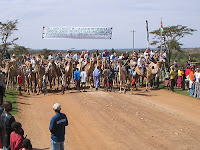 The Samburu Maralal International Camel Derby (SMICD) is an annual event held in August of every year at Yare Camel Camp in Maralal town, Samburu County. Yare Camel Camp is in the northern region Kenya at the heart of the nomadic pastoralist Samburu people who are related to the Maasai. The event has been on-going for 23 years and was initiated by the late Malcom Gascoigne who was the proprietor of Yare Camel Camp. It draws participants from all over the world- Australia, New Zealand, America, Canada, England, France, Spain, Japan, China, Mexico, Sweden, Holland, Italy, South Africa and many other countries. 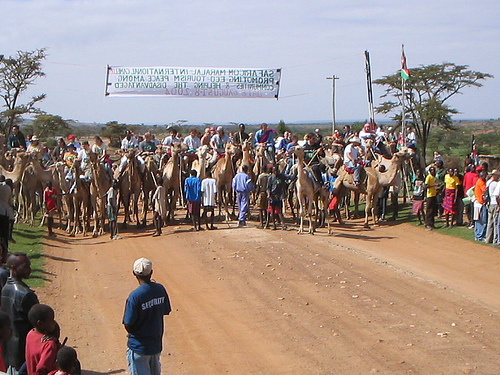 Creating the perfect blend of culture, adventure and action, the finest camels of Kenya are gathered in a display of competition and sportsmanship. The dates for this year’s event are 21st August – 26th August, 2012. Entrants register for participation. Camels are available for hire and come with saddles and handlers. All camels are given a vet-check by the official vet officers. The camels are rendered tick free 4 days prior to the event. The prizes consist of Cash, Trophies and Certificates. Sponsors are also recognized and appreciated for sponsoring various events.